Although iPhone 7 hogged the spotlight at Apple's Sept. 7 special event, the company also announced a hotly anticipated update to its wearables lineup in Apple Watch Series 2. The second-generation device ships next week with GPS capabilities, faster processor, swim-proof housing, a new ceramic edition and more. The Apple Watch Series 2 looks much the same as its predecessor on the outside. However, the new version is powered by a dual-core processor and —much to the delight of avid runners and frequent travelers —on-board GPS. This means users can navigate Maps, track runs and complete other geolocation tasks without being tethered to an iPhone. For swimmers, the new Series 2 Apple Watch is not just splash-resistant like Apple Watch Series 1, but also water-resistant to a depth of 50 meters, the industry standard for a swim watch. Hikers and other outdoorsy types will have fewer issues when taking Watch outside, as the new iteration comes with a much brighter screen. Apple calls it the brightest display that they have ever shipped, on any device. Apple Watch Series 2 starts at $369 for all 38mm aluminum versions, while 42mm models come in at $399. 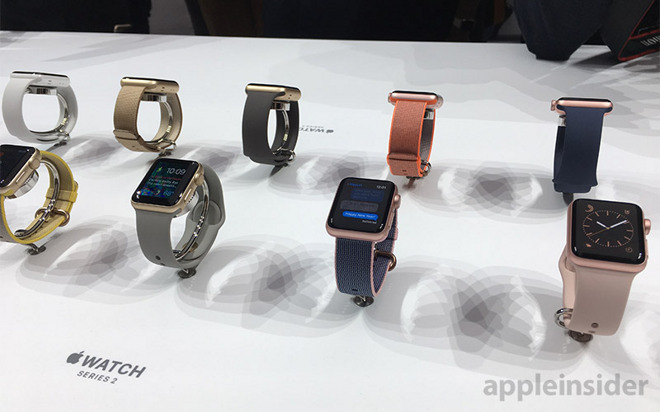 Apple is offering the same silver, gold, rose gold and Space Black colorways in both sizes, with a choice of sport or woven nylon band. Stainless steel and Space Black stainless steel Apple Watch Series 2 models start at $549 for the 38mm version with sport band, or $599 for 42mm. Leather bands, Milanese Loop and stainless steel link bands are also available at an additional cost. Apple and Nike have teamed together for a special edition of the Apple Watch —the Nike+. The exercise-oriented variant of the Series 2 features a unique perforated elastomer band and a lightweight aluminum case. Some questions still surround the Apple Watch Nike+ edition. Right now, there's no certainty that the Nike+ software demonstrated onstage at today's keynote is compatible with regular Apple Watch versions, and neither Apple nor Nike is talking about it just yet. So, if you want the Nike+ look and feel, and the specialized watch faces associated with the device, it may be best to buy that version and get a different watch band for venues not demanding physical exertion. Pricing is identical to non-Nike Series 2 packages. 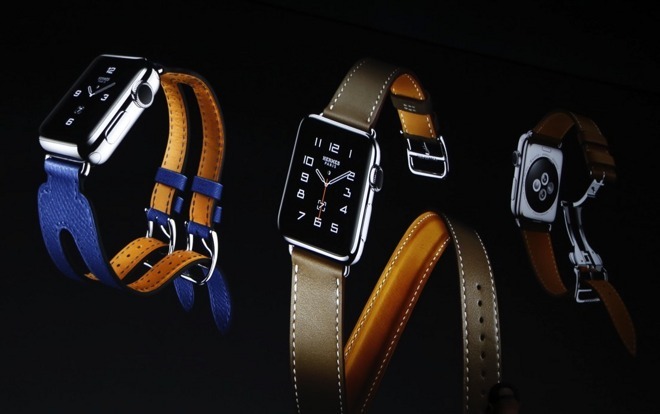 Apple has renewed its partnership with Hermes, and today introduced three new leather bands designed by the French fashion house. You'd better have deep pockets for them, though. The Single Tour band sells for $1,100, with the Double Tour hitting $1,250. The Hermes Cuff is $1,500. Want a gold Apple Watch? Not this time around. Also new this year for the upper crust is a model of the Apple Watch Series 2 crafted from white "pearl-like" ceramic. Apple claims the new material is four times harder than stainless steel, which should help with damage resistance. We don't know much about it yet, as it is literally the first casing of its kind on a wearable. The ceramic model comes with a "Cloud" color sport band and sells for $1,249 for the 38mm case, while the 42mm version comes in at $1,299. If you don't need the better screen, integrated GPS, or swim-rated waterproofing, the original Apple Watch has been slightly upgraded with Apple's faster processor. Rebranded as the Apple Watch Series 1, the device is also less expensive and will retail for $269. How do you get the new Apple Watch? Preorders start Friday, Sept. 9, most likely at midnight Pacific time. Shipments arrive to the first pre-orderer customers on Sept. 16, with retail locations receiving stock shortly thereafter. We're not certain of the demand for the device. The first generation Apple Watch had some pre-orders delivered several months later, so if you want one, it's probably best to get on board early. An Apple retail associate has told AppleInsider that employee training on the iPhone every year program will be held on Thursday, one day prior to the scheduled public release of iPhone 7 and Apple Watch Series 2. We've reached out to Apple for official comment on the matter and will update this article when a response is received.